The first drone delivery by the giant retailer was made in Cambridge, UK and took 13 minutes from purchase to drop-off. It’s been three years since Amazon revealed its audacious plan to deliver purchases by drone. Well, what initially seemed to be a sci-fi scenario turned out to be a reality, as the company is already rolling out its pioneering project. This Cambridge beta program has been in the works for a long time now, as are similar operations in the US and Israel. The delivery itself is fairly simple. The drone picks up the package and is sent out of the facility on a motorized track. After that, it takes off and reaches an altitude of 400 feet (120 meters), makes the delivery, and then return. It will all be much faster than conventional delivery and will only be available to Prime customers – Amazon’s “gold” feature. Naturally, drone deliveries only cover nearby orders, within a few miles of the shipment center. There are also other limitations – drones can only operate during daylight hours when it’s sunny. Any kind of precipitations would severely impede the functioning of the drones. Amazon’s drones – coming soon to a house near you. If you live in the US, UK, or Israel that is. Amazon also says the drones operate in an air space of their own, one that’s reserved for small unmanned vehicles. Clearly, there will be some legal hurdles and some careful planning to be made – especially because delivering in peaceful Cambridge is nowhere near as challenging as delivering in crowded London. But Amazon seems adamant to move forth. 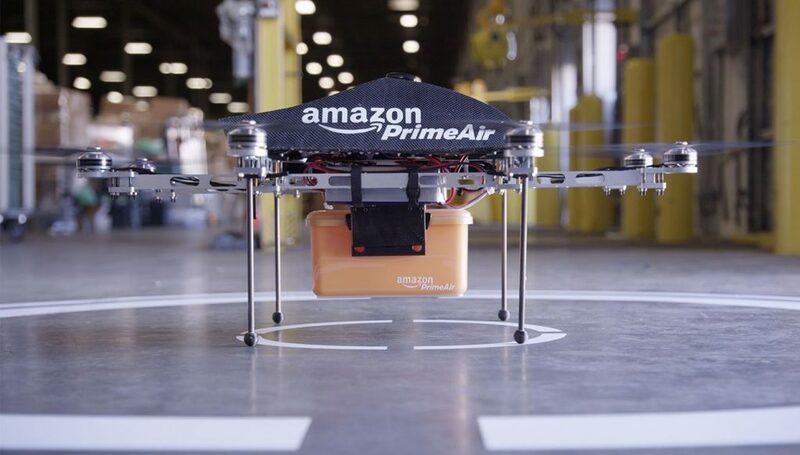 A few years ago, when CEO Jeff Bezos said “one day, seeing Prime Air vehicles will be as normal as seeing mail trucks on the road” most people thought it was a joke. Of course, we’re still far away from drone delivery being common, but we’re getting there. I don’t know about you, but anything that could clear the streets a bit seems like a blessing to me.